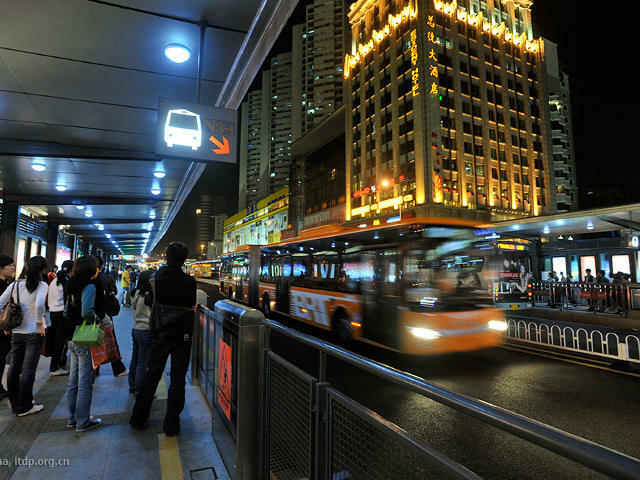 The bus rapid transit system in Guangzhou, China, began operations in 2010. Photo by ITDP-China. Our China Transportation Briefing shares interesting news and noteworthy research related to China’s transportation and urban development. The goal is to help people who are interested in solving China’s urbanization and transportation problems understand relevant Chinese policies and trends. Each issue revolves around a particular theme, with content summarized from recent news and journals. If you have any questions, feel free to contact EMBARQ Research Analyst Heshuang Zeng at hzeng@wri.org. The rapid growth of bus rapid transit (BRT) in China is leading to future opportunities to improve the overall quality of sustainable transport in China. Although the debate on who has the right-of-way on city streets remains, cities could still exert the maximum benefit of BRT by prioritizing the integration of BRT with other sustainable modes. Like many other things happening in China, BRT has experienced rapid growth over the past few years. Though BRT in China has not received as much worldwide attention as underground rail systems, the growth of BRT is still impressive. The first BRT in China was introduced to the city of Kunming in 1999, followed by the BRT in Beijing in 2004, which brought national attention to BRT as a new transport solution. In 2010, the launch of the Guangzhou BRT broke out of the existing mold of low-to-medium capacity BRTs in China by transporting more passengers than most of the nation’s metro lines. The city adopted a direct service model, which allows for defined BRT routes (not only the trunk routes) passing by the corridor to use the dedicated BRT lanes. Today there are 17 bus rapid transit systems in China, serving 2.3 million people every day — and most of these systems were built since 2008. According to BRTdata.org, a comprehensive, global database created in 2012 by EMBARQ and the Bus Rapid Transit Centre of Excellence, in collaboration with the International Energy Agency, BRT systems have spread out across different regions in China. Though most systems are concentrated along the coast, BRT recently established roots in the western region of China, in Lanzhou, Urumqi, and Yinchuan – three cities that, together, account for 7.7 million people. Most BRT systems are located in second and third-tier cities, or municipalities with populations of less than 5 million. Since these cities usually do not have urban rail systems, BRT systems are designed as the backbone public transport system. According to a recent study by Tongji University, there has been a diversification of BRT models in China, with much success in operations. On average, each BRT system in China serves 30,000 to 40,000 passengers every day. Even though most systems consist of one or two corridors, averaging 40 kilometers in length, they have shown their potential for playing a central role in public transport. In Changzhou, BRT ridership accounts for more than 25% of total passenger trips on public transit. Its two corridors run north-south and east-west, transecting the city. With good planning and design, the Changzhou BRT is accessible to many city residents and commuters and has been regarded as one of the most successful BRT systems in China. Despite the rapid growth and good performance, BRT face challenges in terms of public debate over the right-of-way on city streets, as well as integrating with other modes of transport. As is the case in many other countries, doubts over BRT’s right-of-way in China have never ceased. The doubts over BRT arise from unfamiliarity with the BRT concept and a mindset that private cars own the right-of-way in cities. Early BRT systems like that of Hangzhou raised questions from residents when it came to the use of two lanes for moving buses exclusively, and this criticism only ceased when the systematic effects of BRT such as convenience, became gradually evident. Similarly, in Guangzhou, locals called BRT, “Bu Rang Tong”, meaning “it is not allowed (for cars) to pass through”. In Chongqing, public opposition to a 2008 dedicated BRT lane, which was believed to cause congestion, prompted the government of Chongqing to allow other buses to use the lanes – a move which did not deter complaints from private car drivers nor ultimately save the corridor from being demolished. Chongqing also holds the dubious distinction of being first BRT that has been torn down in China. Although BRT systems generally perform well, cities could still maximize their impact through better integration with other public transit modes, such as the subway, traditional buses, and non-motorized transport modes. Currently in this area, most BRT systems fall short. In terms of information integration, few BRT systems provide clear maps of the BRT in relation with other public transit modes– a feature which would assist passengers in making multi-modal trips. The Urumqi BRT set up a new website, providing real time info from each individual BRT line, but it is hard for users to find an overall map of the BRT system and understand how it connects with other bus routes. In terms of physical integration, Hangzhou’s 100-km BRT system is yet not integrated with the metro system, while in Beijing the BRT lines are only linked with Metro Line 2. Some cities in China are setting a precedent for modal integration, such as the Guangzhou, which integrates bike-sharing stations alongside its BRT stations and also provides direct, built-in connections between BRT and subway stations. This design is also considered a best practice worldwide. BRT is likely to continue its rapid growth in China. According to data shared by the China Sustainable Transport Center, there are about 1000-km BRT in China under planning now. Recent policy directives by the State Council also recommend BRT as a key component to include in surface public transport system in China. In the second and third-tier cities, BRT can serve as the backbone system, as seen in Changzhou, while in large cities — where the conditions for rail transit are available — BRT could still play a supplementary role to metro and rail systems, such as the case in Beijing and Guangzhou. It is unquestionable that the right-of-way debate will continue in China. A change of public mindset toward a “people first” street design requires public education and time, as some awakened urban transport professionals in China are now trying to address this issue in transportation planning. The design and information integration of BRT with other systems will add great value to the promotion of sustainable transport in cities and could be applied to new BRT projects in China. With forthcoming opportunities, taking these considerations into account will help BRT to exert maximum impact to catalyze better and bigger changes in China’s urban transport system. China Transportation Briefing: Kingdom of Electric Vehicles?